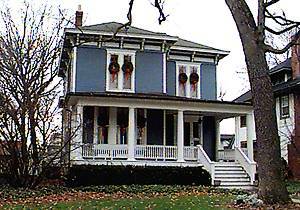 Oak Park has an oustanding collection of Italionate houses, and this is a perfect example. It has tall narrow windows and a striking belvedere (tower), both typical of the Italionate style, as are the decorative brackets under the eaves of the low-pitched hip roof. Wright's Prairie style is partly a rebelion against this style, which Wright refered to as "Those Boxes".